In October of 1890, the historic Dam Keeper’s House was built using hand-cut granite blocks from the same quarry that provided the stones for the first dam. For nearly a century, this was home to over a dozen dam keepers and their families. The famed Bill Knickerbocker and his family were early residents between 1909 and 1918. After the Municipal Water district purchased the lake in 1977, and water would no longer be released for irrigation, there would be no need for a resident dam keeper. The water company returned the house to the forest service with the hope that it would become a museum. This never came to pass, and today this historic building that was built to last forever, sits in an advanced state of deterioration and neglect. The roof has completely fallen in, the south facing wall has fallen down and it appears some of the blocks have disappeared. The inside walls are covered with graffiti as well as some of the rocks surrounding the house. 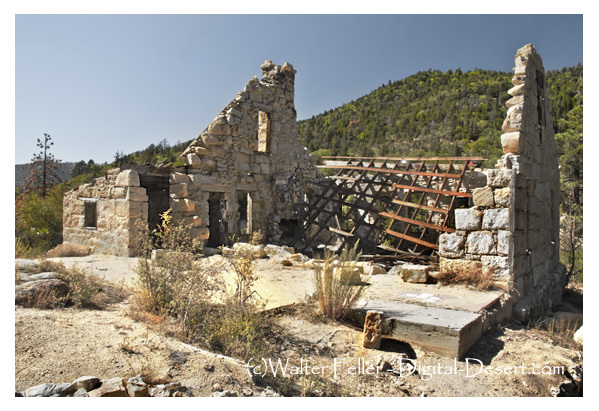 After 1915 the government began leasing summer home sites near the dam for $15 a year. These sites were along both the north and south side of the lake. Many of these picturesque cabins remain today, and some are owned by the same families that built them. Since there were no roads to this area at the time, all the lumber and supplies had to be brought over by boat.